We made several changes to this chart in the latest refresh, including saying goodbye to two models that had increased in price – the Squier Affinity Stratocaster HSS, and the Oscar Schmidt OE20. However, these were replaced with a similar Strat in the Squier Affinity Stratocaster SSS, as well as the cool Squier Bullet Mustang HH and the ESP LTD Viper-10. Are These Budget Guitars Only For Beginners? A solid single-coil Strat from Squier! An authentic Les Paul with a budget price tag. Real winner when it comes to style and rock attitude. Great value from this marvelous Mustang! A vintage-inspired Tele with a modern budget price tag! LTD does the basics right to deliver a solid Viper. A very solid budget option from Ibanez. A rock legend and a modern classic in the budget beginners market. As you are about to read, there are some incredible options that offer superb playability, clear and toneful sounds, and good craftsmanship, even in the lowest price range. 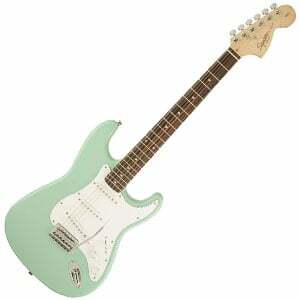 Leading this list is the classic Stratocaster from Fender’s budget subsidiary, Squier. This budget model shows off everything you’d want from a Strat, including a few advanced design points that put it in a category above Strats in the Bullet Series. You’ll find the traditional double-cutaway body made from alder, with a rainbow of finishes to choose from. There’s a bolt-on maple neck, as well as a maple fretboard and 21 frets. 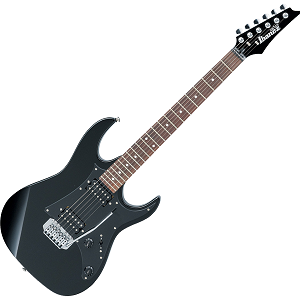 This Strat features three basic single-coil pickups and responsive controls. The sound is pretty much everything we expected from an affordable Strat, with nice brightness and sparkle, and a touch of the genuine Fender tone. Well worthy of the price tag – as we highlight in the full Affinity Strat SSS review! We couldn’t compile a list of the best beginner electrics without including a ‘real’ Les Paul, from the Gibson subsidiary Epiphone. The incredibly popular Special II features everything you’d want from both a Les Paul and an affordable beginner’s guitar. This includes the familiar single-cutaway mahogany body, along with a bolt-on okoume neck featuring a comfortable SlimTaper D profile, a rosewood fretboard and 22 frets. As highlighted in the main review of the Epiphone Les Paul Special II, this guitar comes with two humbuckers (a 650R and a 700T) and simple controls, keeping things easy for beginners, as well as reliable hardware. The highly affordable price is the icing on the cake! Yamaha are the kings of quality on a budget, and we’d be out of our minds to leave a Pacifica off this list. As we state in our full review of the PAC012, this guitar is an awesome budget choice. And because you aren’t paying for the name, you get a lot more for your hard-earned cash. The PA012 has a well-defined, but comfortable double-cutaway body, made from solid agathis, with a maple neck and rosewood fretboard, with 22 frets. The two single-coil pickups and humbucker, along with a five-way pickup selector switch and tone controls, give you plenty of versatility in your sound. Throw in a vintage-style tremolo bridge and you have a very playable, comfortable, and good-looking package, with the sound to match. This black beauty from ESP’s LTD shows off true rock style and a very playable neck at a price that doesn’t break the bank. 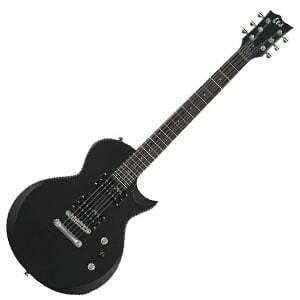 The EC-10 features a glossy black well-contoured single-cutaway body made from solid basswood. There’s a bolt-on thin U-shaped maple neck, with a rosewood fretboard, and 24 extra-jumbo frets, which makes fast playing and string bending a breeze. As we highlight in our full review, the EC-10 is voiced by two ESP-designed passive LH-100 humbuckers at the neck and bridge positions, which are loud enough to cope with rock and metal lead playing, although articulate and warm when playing without distortion. Hardware is kept simple, with a tune-o-matic style bridge and stopbar tailpiece, and a single master volume and tone control knob. Whether you have smaller hands or just prefer that laidback Mustang vibe, this affordable Squier Mustang Bullet is a solid choice and proves great value for guitarists – whatever your level. At well under $200, it scores top marks in value for the classic design, solid build and winning sound on offer. While it features basic humbuckers, the tone that comes with it is surprisingly full and soulful, working well for everything from indie to punk rock. With a basswood body, C-shaped maple neck and reduced 24” scale length, it’s a lightweight axe that’s super-fun to play with. Want more on this cool little axe? Check out the full review of the Mustang Bullet HH. Jackson’s JS22 Dinky is an affordable guitar that would suit advanced players as much as it would beginners! With a good dose of edge and elegance, it’s perfect for anything from soft rock to thrash metal. It’s a great looking instrument – featuring an arched-top basswood body with a deep double-cutaway design, allowing ample access to 24 jumbo frets on the neck, which is a bolt-on graphite-reinforced maple ‘speed’ neck. It’s fast, sturdy, and fun to play on. The guitar is voiced by two high-output Jackon-designed humbuckers, which offer the classic Jackson tone, and make light work of both clean and distorted tones. 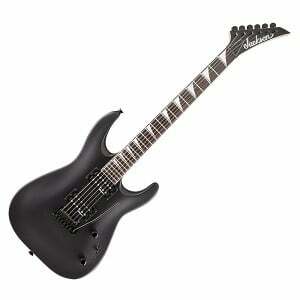 The black hardware, tremolo bridge, and classic Jackson headstock finish it off nicely. Check out our full review of the JS22 here. 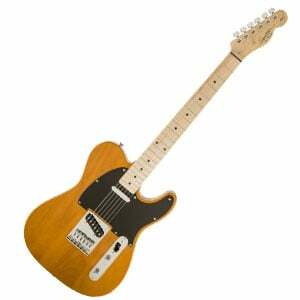 Some Telecasters can reach prices of up to $10,000 – but not this one! Fender’s budget division Squier are kings at putting together affordable versions of their parent company’s most famous models, as the Affinity Telecaster proves. Great for beginners and players on a limited budget, this model features the timeless Telecaster body shape and distinctive headstock. Along with the Butterscotch Blonde finish, it really does crank up the vintage! The C-shaped maple neck plays very well, and the overall package feels well-made for so few beans. As we mention in the complete Affinity Telecaster review, the electronics conform to the traditional Tele setup, with two basic but effective single-coils at the neck and bridge position. For the metalheads on a budget, the Viper-10 from ESP’s LTD is a worthwhile addition to your shortlist. With this affordable axe, LTD has put the focus on doing the basics right – and this really pays off. As we explain in our main review of the Viper-10, this solid guitar sports the familiar ‘SG with attitude’ Viper body design, with a lightweight basswood construction. There’s a slim maple neck with 24 extra jumbo frets, so playability is excellent for the price. This Viper is equipped with two LH-100 humbuckers that deliver a surprisingly full sound that’s great for rock, metal and even blues. Of course, the hardware is basic, but it all combines well to deliver a stable experience. If you’re looking for a beginners axe with a little attitude, the Ibanez GRX20 should be one of the top choices on your list. The poplar body has a deep double-cutaway RG-style shape, with two finishes to choose from (Jewel Blue or Black Night). It also features a good quality bolt-on maple neck that’s fast enough for beginners, with a rosewood fretboard and 22 medium frets. Two Ibanez-designed Infinity humbuckers at the neck and bridge positions give this entry-level offering plenty of bite for distorted tones, but works just as well for softer, cleaner numbers. Considering how affordable the guitar is, the overall feel and sound you get is a big surprise – as we mention in the full GRX20 review. An entry-level offering from Dean, with rock in its heart. With a couple of different bold color options to choose from, it features a solid paulownia body with Dean’s familiar Vendetta double-cutaway shape and winged headstock, while the slim bolt-on maple neck has a rosewood fretboard housing 24 frets. When it comes to features, this XMT doesn’t boast many, but it does the simple things well. Two passive Dean-designed humbuckers at the bridge and the neck handle all kinds of heavier rock very well, while a tone control and a three-way pickup selector switch offer enough versatility. 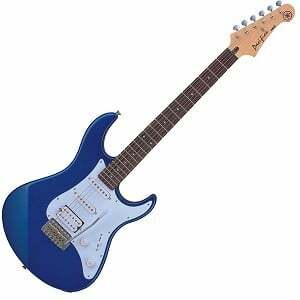 It also comes with a vintage tremolo bridge and whammy bar for some cool vibrato effects. Be sure to read our full review of the XMT. If you have been playing for a year or two and are looking at something to replace your current model, it would be wise to save a little more and go for a mid-range guitar that may cost between $300 and $500. On this kind of guitar you’ll notice a big difference in sound, as well as the feel of the instrument and the overall playability. Use this page as a starting point to find something that may suit you. Until then, you are probably best off sticking with your current guitar. Even though the choice in this budget range is not as expansive as, say, the $300 to $500 range, there are still many different manufacturers and styles on offer. The woods used on the body and neck are worth considering too, although are unlikely to be a defining factor when you consider your purchase. Basswood features heavily as the body wood of many guitars in this price range because it’s affordable and has decent tonal properties. You will also find cheaper to produce woods like poplar and alder, although the traditionally more premium mahogany is also found on budget guitars these days. You’ll also find mahogany on some necks, while maple is the most popular in this price range. Both are sturdy, strong and smooth, which is everything you need from a neck. Another consideration, and something you’ll read a lot about, is the pickups, which give the guitar its voice. There are two kinds of pickup in this price range: the single-coil (which gives a bright, sparkly sound) and the humbucker (which is fuller, meatier and perfect for rock and metal). Both are as common as each other in this budget range, and a guitar with a mix of both will offer you the best versatility. Finally, you’ll want to make sure you have the accessories you need to get up and playing fast. A strap, spare strings (they do break from time to time), and some plectrums are all essentials – and don’t forget an amplifier! You’ll also want a case (preferably hardshell, but soft and padded will do) to store and transport your guitar, and an electric tuner to keep it sounding good. These can all be picked up from your local guitar store, although if you are starting from scratch, you may want to consider a combo kit, which usually offer good value and convenience. This was an excellent read article, specially for a beginner like me. ROGUE guitars have been a staple of Musician’s Friend for a Looonnng time. I bought my Hofner Beatle-Bass copy maybe 20 or more years ago and it’s been my go-to bass ever since. I have sooo many basses, many costing 20 times what I paid….and, the cost makes no difference…The ROGUE holds its own. It just got here and is incredible for the money. Took 2 minutes to tune and looks just beautiful. I am so excited to learn to play. 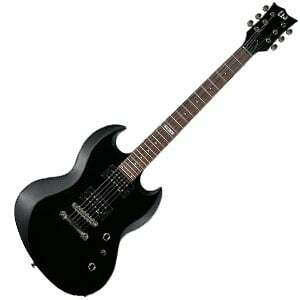 Where do i get the bc rich warlock for under 200$? I’m a fan of classic rock music, especially Led Zeppelin, and want one with that calssic sound . Which one would you recommend? Either the Les Paul, the Stratocaster Or the Telecaster probably. One of the guitars Jimi Page played was a Les Paul. Squire telecaster is definitely the loggiest neck in this price range.. should suit your needs nicely. Ive already got my Metal guitar. 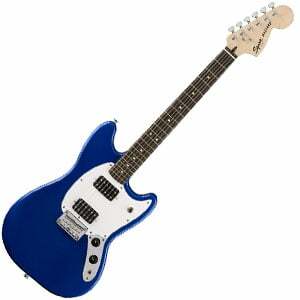 Now I would like something in this price range that’s more versatile but also has a tremolo. I’d like to get adventurous with it. What do you suggest? Is there a specific reason you left Harley Benton models off this list? Both the SC-450 and the SC Custom come in under the $200 mark and, I think, good competitors for the others listed.